No other honey tastes as good as Really Raw Honey! 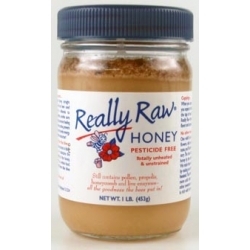 Really Raw Honey is totally unprocessed honey. It still contains pollen, propolis, honeycomb and live enzymes -- all the goodness the bees put in! That's why Really Raw Honey is creamy, smooth and spreadable with sweet and crunchy cappings. Really Raw Honey is gathered from fields of wildflowers planted by nature, without pesticides or fertilizers. One whiff of our honey, with its distinctive aroma of wildflowers, tells you this is something special. With your first taste, you'll know you are eating something utterly extraordinary. The flavor is unlike any honey on the market. The bees choose the color, flavor, and texture of our honey by the varieties of wildflowers and herbs they forage. We retain these qualities and all the nutrients the bees put in by making sure that our honey is never strained, never filtered, and never heated. Really Raw Honey is excellent for throat inflammations,gastritis and stomach ulcers, being a powerful antiseptic it helps combating infections and inflammations of upper airways.